Home Training Weight Loss Is Your Workplace Responsible For Your Weight Gain? Workplace stress and pressure continues to take a toll on employees that show up in the form of obesity and weight gain. Employees spend nearly a quarter of their lives at their workplace, and the demanding requirements of work may affect their eating habits. 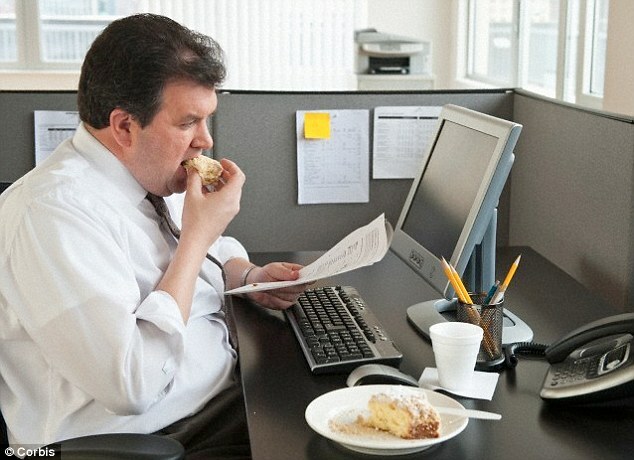 Unhealthy eating habits and bad diet will ultimately affect work performance. You will then end up spending your hard-earned money on medicines and health checkups. According to a national survey done in India, 51 percent of employees have agreed that they gained weight after joining work. Nearly 30 percent have gained at least 2 kilograms on their existing weight within the first six month. Only 11 percent of Indian employees admitted to have lost weight at their current workplace. What are the reasons behind weight gain at the workplace? Nearly 60% employees believed that sedentary work style is the culprit behind their weight gain. 35% said that they don’t get time to exercise. Around 25% respondents agreed that they always skip their meals due to work related stress. While 38% workers gained weight due to eating out regularly, 20% blame the lack of healthy meals for their workplace weight gain. Exercise and good eating habits are a vital part of a healthy lifestyle. It will certainly help workers to shed excess weight. 1.Wrong body posture and sitting in the same posture for long duration may cause muscle tightness and fatigue which in turn adversely affect the work efficiency. Poor body posture may cause problems related to neck, shoulders, waist, back, wrists and fingers. To avoid these problems, stop using elevators and start taking the stairs at work. This may help you to burn calories. 2. Take a short break in between the work. Do deep breathing. Get up from the chair and jog in place. Take a stroll around workplace during the lunch break. Exercise improves the mobility of joints, relieves stress, relaxes the mind and enhances blood circulation. People who spend long hours sitting at the workplace are advised to opt for mobility and stretching exercises. 3. When it comes to eating habits, it is difficult for employees to resist snacks, junk foods and restaurant meals. It is mainly because you look to grab a bite of something you can get your hands on immediately but this only does more harm than good. Diet can affect work performance. At such times, eat a fruit or some multi cereal biscuits. 4. Drink sufficient water to avoid dehydration. Keep an eye on your weight always and count what you eat. In the end, only you can be solely accountable for your health and it is in your hands to take necessary steps to keep yourself fit. Previous articleIs It Safe To Have Fat Burners? I found this article very informative, to the point and helpful. It is precisely written in simple language. Waiting for more healthy articles. Thank you. We are constantly trying our best to post the most helpful articles.